An Early Iron Age settlement and a Beaker period cremation and inhumation cemetery were excavated in the 1960s. Two Iron Age buildings were excavated and many Iron Age objects including fragments of pottery, complete vessels, animal bones and a bone weaving comb were recovered. Seventeen Beaker period burials were also excavated. Several cremations were contained within vessels and one inhumation was that of a child. Later fieldwalking recovered Iron Age pottery, prehistoric flints and identified several possible other Early Iron Age structures. Human bone. Bronze Age burial? Found in agricultural works sectioned afterwards. Querns, weaving comb found. See dissertation by P. Shand (S1) for further details. Inhumation cemetery. Beaker pottery, (S4). 2 leafed-shaped arrowheads (S5 and S6) and a Neolithic scraper (S7) were drawn. Iron Age and medieval sherds and a polished bone (S8) found. Iron Age chalk weights possibly loom weights, (S9). Identified by A. Rogerson (HES), 6 June 2014 from the illustration. H. Mellor (HES), 6 June 2014. Iron Age or Early Saxon sherds found. 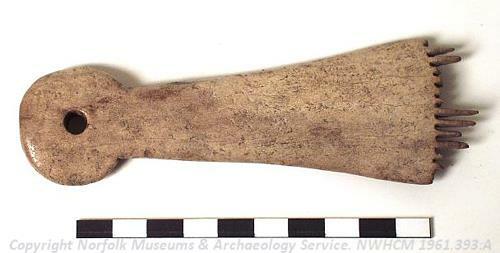 It is noted that the cores are small and heavily corticated with blade scars; suggesting a possible Mesolithic date. P. Watkins (HES), 22 October 2013. For full details see lists in file. For full details of Fenland wares, flint types, etc. see (S2). --- Fieldwork: Fenland Survey. FWL 110. FENS. --- Monograph: Healy, F.. 1996. The Fenland Project, No.11: the Wissey Embayment: Evidence for pre-Iron Age Occupation.. East Anglian Archaeology. Vol 78. pp 30-6, 38-9. --- Monograph: Healy, F.. 1996. Fenland Project No.11.. East Anglian Archaeology. Vol 78, pp 30-5. --- Archive: Clarke, R. R. and NCM Staff. 1933-1973. Norwich Castle Museum Record Card - Iron Age. Feltwell . <S1> Unpublished Report: Shand, P. 1984. Cauldron Field, Feltwell. Excavations of an Early Iron Age Settlement at the Fen Edge, 1962. <S3> Monograph: Healy, F. 1996. The Fenland Project, Number 11: The Wissey Embayment: Evidence for pre-Iron Age Occupation. East Anglian Archaeology. No 78. Appendix 8 (Microfiche). <S4> Illustration: Unknown. 1975. Drawings of a Beaker pottery sherd.. Film. 1:1. <S5> Illustration: Unknown. 1975. Drawings of a Neolithic leaf-shaped arrowhead.. Film. 1:1. <S6> Illustration: Unknown. 1975. Drawings of a Neolithic leaf-shaped arrowhead.. Film. 1:1. <S7> Illustration: Unknown. 1975. Drawings of a Neolithic scraper.. Film. 1:1. <S8> Illustration: Gregory, T.. 1975. Drawings of an undated polished bone.. Card. 1:1. <S9> Illustration: Gregory, T.. 1975. Drawing of Iron Age chalk weights possibly loom weights.. Card. 1:1.